People in Tamilnadu are in the Festival Mood as there is just a couple of days to celebrate Pongal Festival. Tamilnadu Film Industry considers Pongal as auspicious time and they have come out with several Tamil Films to be released on Pongal 2011. Fans of Tamil Film Personalities are eagerly waiting to watch out for Pongal Release 2011 Tamil Movies. Here you can find the Pongal Release 2011 Tamil Movie Reviews and Information. This Film is so different double action in Karthik, but Santhanam and Rocket Raja carrector so beautiful Entertainment Movie first half only. Siva has directed the action Tamil Film Siruthai which is a remake of the Telegu Film Vikramarkudu by Director S.S. Rajamouli. Karthi and Tamannaah plays the lead role. Hilarious comedy was done by Santhanam along with Karthi on this upcoming Tamil Movie Siruthai. Music composition was done by Vidyasagar and the film was cinematographed by Velraj. Producer of the film Siruthai is by K.E. Gnanavelraja. One can marvel at the stunts on the movie Siruthai done by Karthi. Pongal Release 2011 Tamil Movie Siruthai is scheduled to release on January 14th 2011 on Pongal Festival under the banner of Studio Green Productions. Aadukalam an upcoming Pongal Release 2011 Tamil Movie was directed by Vetrimaran and lead roles were played by Dhanush and Taapsee Pannu a Delhi based model and it is her first film in Tamil cinema. Music Director for Aadukalam is G.V. Prakash Kumar and Cinematography of the film Aadukalam was taken care by Velraj. The film is based on real life story happened at Madurai in the year 1970s. Aadukalam was shooted mainly at Thirunagar, Thirupparankundram and in some other areas. Kathiresan is the producer for Pongal Release 2011 Film Aadukalam. Aadukalam is scheduled to be release on January 14th 2011 on Pongal Festival under the banner Sun Pictures, Anygaran International and right now promotions of the film is carried on by Sun TV. Superb Fantastic Different Love Stories Movie of the Year 2011 Illyathalapathi Dr. Vijay's one of the favourite movie. The upcoming romantic Tamil Film Kaavalan was directed by Siddique and it's a remake of Malayam Film Bodyguard Tamil Actor Vijay, Asin, Rajkiran and Roja plays the lead role and comedy track was taken care by Vadivelu. Music Director for Tamil Film Kaavalan is Vidyasagar and the film was cinematographed by N.K. Ekambaram under the banner of Ekaveera Creations. One particular song was shooted at Kuala Lumpur in Malaysia and some of the scenes were shooted at Vellore and some scenes at Vellore Institute of Technology and the Pongal Release 2011 Tamil Film Kaavalan was scheduled to be release on January 14th 2011. 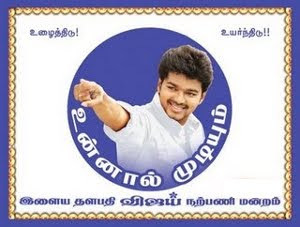 Fans of Vijay are eagerly waiting to watch the Tamil Movie Kaavalan. Upcoming Pongal Release 2011 Tamil Film Ilaignan is directed by Suresh Krishna and it is his 50th Film as a director and the movie was based on novel written by Chief Minister M. Karunanidhi and it is his 75th film as a writer. The star cast of the upcoming Tamil Film Ilaignan is Pa.Vijay, Meera Jasmine, Kushboo, Namitha, Vadivelu, Nassar, Delhi Ganesh, Manivannan to name a few. Producer of the film Ilaignan is by S. Martin and Music director of the film is Vidyasagar. The promo of the film Ilaignan is going on in Kalaignar TV and the film is scheduled to be released on January 14th 2011 as Pongal Release. The upcoming Pongal Release Tamil Movie Engeyum Kaadhal is based on romance which was directed by Prabhu Deva under the banner AGS Entertainment. Jayam Ravi and Hansika Motwani plays the lead roles in the film. Music was aired up by Harris Jayaraj and this film on Engeyum Kaadhal is produced by Kalpathi S.Agoram. The songs of Engeyum Kaadhal was shooted at Sydney and film started its shooting on Paris and Nirav Shah has cinematographed the film. Lyrics writers for the songs are Thamarai, Vaali, Emcee Jesz, Kash, Madhan Karky and Na. Muthukumar. The film is schedulted to be released on Pongal 2011.